Home More Disney runDisney Returns to the Bahamas for the 5th Anniversary Castaway Cay Challenge! runDisney Returns to the Bahamas for the 5th Anniversary Castaway Cay Challenge! If you’re going to run 16,404.2 feet, why not do it on a private island in the Bahamas? Did you know that on January 14, 2019, you can top off the Walt Disney World marathon weekendwith the ultimate runner’s vacation, a four-night cruise on the Disney Dream and entry into the Castaway Cay Challenge? That’s right – runDisney is returning to the tropics for the fifth edition of this exclusive race, and you can join in the fun on the private island paradise of Castaway Cay! After you participate in one race during marathon weekend, head over to Port Canaveral to start your vacation – but don’t put away your running shoes just yet. When the Disney Dream docks in Castaway Cay on Jan. 16, you will start your morning off with a 3.1-mile race around the island, complete with ocean breezes, salty air and palm trees! Make sure you have room in your suitcase, because you will also be adding two medals to your collection after this unique race! 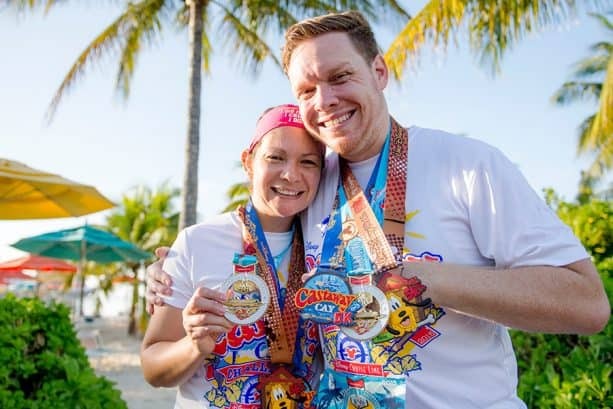 Not only will you be taking home the 5k medallion and Disney Castaway Cay Challenge medal, but participants also get a race bib and T-shirt, along with on-course and post-race refreshments. And the best part is – you have the rest of the day to enjoy all that Castaway Cay has to offer! Relax in a hammock on the white sand beaches, snorkel in a lagoon with hidden surprises, take a ride down the slides of Pelican Plunge, grab a tube and float the day away on the crystal-blue waters of the adults-only Serenity Bay, and perhaps best of all, you won’t feel bad indulging at lunch in one of the open-air BBQ dining locations (don’t forget the big island chocolate chip cookies!). Availability is limited for the Disney Castaway Cay Challenge, so book your cruise today and start your countdown to this ultimate runner’s vacation! Previous articleDisney, Marvel and Star Wars Toys Among the 2019 Toy of the Year (TOTY) Award Finalists! Next articleNew Disney Parks Exclusives Star Wars Sandcrawler Playset Now Available Online! Previews of four new Toy Story 4 Pop! Vinyls Released plus Order Info! New Walmart Exclusive Toy Story 4 Gabby Gabby with Forky Pop! Vinyl Coming Soon! New Pop-Up Disney! A Mickey Celebration Merchandise is Popping Up in Downtown Disney at Disneyland!